I am Rob Divers, RN/Clown/Magician. I am thrilled to share of a recent trip to Israel I made to visit a remarkable program called “The Dream Doctor Project”. 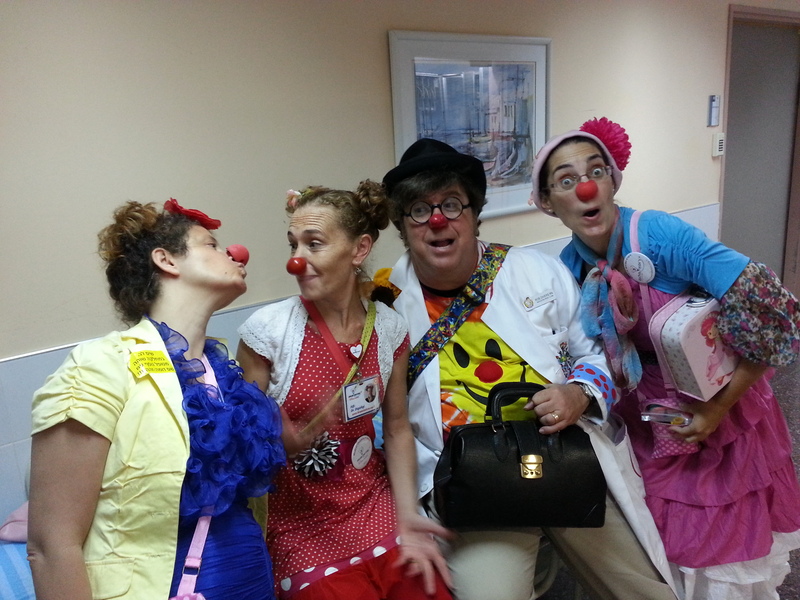 http://www.dreamdoctors.org.il Dream doctors are professional medical clowns who work in hospitals throughout Israel to alleviate stress and anxiety of patients and assist medical staff with procedures and therapies. This being the “business” purpose of my journey, there is also a spiritual and personal mission at work also. I am an RN of 20 years with experiences in ER and pediatrics. I have taken a new direction in my nursing career to explore the benefits of using performing arts like magic, comedy and music integrated with my nursing practice. In 2012 I started a new business as a clinical entertainer. You can learn more by visiting my website at: http://www.magicnurse.com I have discovered a better way to connect with patients, following the inspiration of the Patch Adams movie, then ultimately from Patch himself. I first learned of the Dream Doctor project as I studied clown arts early in 2012. September that same year, I accompanied the real Patch Adams on a clowning mission to distressed communities in Costa Rica. This experience prepared me to take my clowning to new levels to find integration between the performing and healing arts. No program in the world does it better than the visionary medical clowns in Israel. The Dream Doctors are trained in theater and select medical related studies. They enjoy the only program in the world where a college degree in medical clowning is available at the university in Haifa. My adventure began when I contacted the Dream Doctor Project early in March 2014 to arrange for a trip to Israel to visit their program. The program administrators enthusiastically welcomed me to come the following September to work with their best clowns at multiple hospital sites. They arranged for me to visit hospitals in Jerusalem, Haifa, Afula, and Tel Aviv. This two week adventure, being my first time in Israel, had enough time built in to explore the historic and holy locations in between hospital days. This trip had special gifts in store for me that I could not have realized as my adventurous spirit was drawn to this remarkable place. Against the advice of dear friends and family concerned for my safety, I was compelled to follow through with this plan. Fortunately the rockets have stopped, and life is peaceful there for now. During the hostilities, Dream Doctor clowns visited bomb shelters in addition to their hospital work, to help their communities. This is serious clowning to be sure! I was so impressed with the care and professionalism the medical clowns have for their unique role as part of the healthcare team. The first facility I visited, Alyn Hospital in Jerusalem, was a pediatric and adolescent rehabilitation facility with a rich cultural diversity of Arab, Palestinian, Russian, Armenian, and Israeli children all in one place. There is mutual care and respect for all faiths and nationalities within the hospital, and no better ambassador than the universally accepted role of the clown. Funny is funny no matter where you are from. The therapeutic clown assists physical and occupational therapists in motivating children to meet therapy goals by finding new ways to make the therapy fun, and playful, and even enjoyable. This is where the clown is a true artist in improvisation and therapeutic game play. I spent quality time with the psychologist who oversees the therapeutic clowns and we agreed how powerful a clown can be to draw out the imagination and joy of a child experiencing difficult physical and emotional trauma. The clown therapist is a great long term friend and playmate to help these brave patients work towards improved function. Here the clowns are actually scheduled to participate in the therapy sessions, and really make a difference in the outcomes. The clowns are not just for kids only. Further north In Afula at HaEmek hospital, I found the clown artist is appreciated by adult patients as well. I spent time with a gifted theatrical artist and professional dancer who has focused his skills to making the experience for dialysis patients more pleasant as they spend 4 hours a day 3 times a week receiving dialysis. It was like theatre in the round being surrounded by several patients in this open unit where a stage is created when the clowns arrived. I found a great use of my ukulele here, and the Elvis songs were the most popular among the ladies especially. Once again I found the multicultural experience to be the same, seven different languages were spoken by the variety of patients in dialysis chairs, but everyone understands the clown. And who doesn’t love Elvis? I had spiritual and meaningful experiences on many levels in this journey. While at the most revered Holy sites where my faith is based, I felt closer to the reality of seeing where these miraculous events took place. To breath the air and share this place with other pilgrims from around the world. To be able to pray in these places, and touch the western wall. I gave thanks to God for all he has done, and is yet to do in my life. I am without words to adequately describe these moments in my adventure, I am just so very thankful to have. connected with these amazing places. I am so thankful to all the Dream Doctors I met and had the pleasure of performing with. I am especially thankful for Karin who guided every step of my journey and looked out for me as I traveled around the country. In addition to the hospital experiences, where she gained administrative approval for me to work with patients at every location, she treated me to theatrical performances of 2 amazing productions written and produced by Dream Doctor clowns outside of their hospital work. The capstone of it all was sharing in a celebration dinner where ALL the clowns, and program administrators were gathered to celebrate the upcoming Rosh Hashanah season. Since many of the clowns work in all parts of the country, they often only see each other at gatherings like this. It was like being at a large family reunion, and the love these clowns have for their work and for each other is beyond inspirational. A company of healing artists gathered together filled the room with such joy. They are a shining example of a loving work for the benefit of their society. I could only imagine what it would be like if we in America could do the same for our neighbors! God Bless you Dream Doctors! Thank you again my dear clown friends for sharing your time, love and knowledge! I will never forget you!